Handy Backup Pro is a speedy, effective and comprehensible utility capable for backing up data from personal computers including home, office and business-level workstations. It is designed for users who need to back up not only files, but also pro-level data such as databases, websites or entire system images. 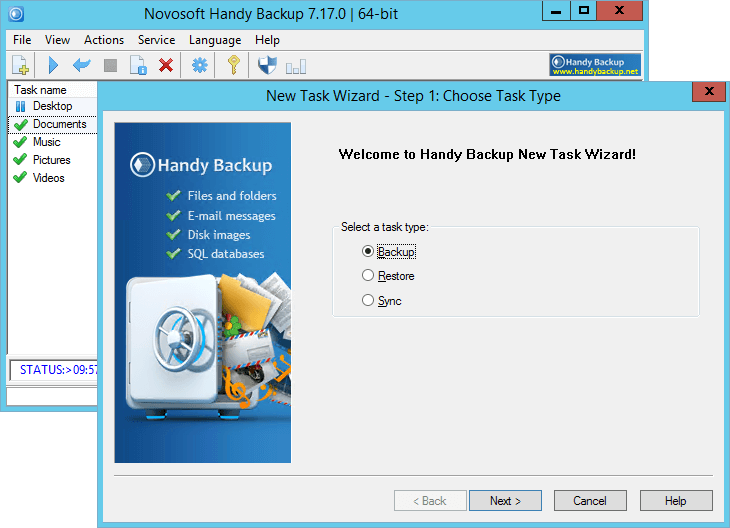 Handy Backup Professional provides some options highly required for experts and advanced users. The Professional edition can save an image of any drive as a VHD file. Users can restore this image later (including the possibility of creating a bootable device), or attach this VHD file as a virtual drive and browse its content, or even run it as a complete image of a VirtualBox machine. Professional edition is capable to save copies of data to all popular clouds such as Dropbox, Amazon S3, Google Drive, OneDrive and OneDrive for Business, Backblaze and other. You can use backup information without restoration, as Handy Backup saves data in native format, allowing using this data directly from cloud. In the Professional edition, not only FTP servers are supported but also the protected FTP exchanging protocols, SFTP and FTPS. These features allow connecting with any type of FTP servers, for backing up such an information as website static content and secured FTP data. Handy Backup Professional shares many control and automatizing options with other editions, allowing users fully controlling their backup, restoration and synchronizing tasks. Starting automatic backup to external hard drive when it is plugged in to a PC. Keeping a specified number of versioned backups for one dataset, removing obsolete data. Handy Backup data storage (HBDrive) keeping data in a protected vault. Database tool in Professional edition is capable to backup and restore database tables with the help of ODBC drivers. Remember that an ODBC driver for your database is not a part of Handy Backup! Learn how Database plug-in works*. Database plug-in is developed for backing up tables of such databases as Access, FoxPro, Firebird, Sybase and other. To make full “hot” backup copies for MySQL, MS SQL, PostgreSQL and Oracle we recommend using Handy Backup Small Server or ordering plug-in for chosen database. Starting the program as a Windows service, removing distractions from a user during the job. Other requirements: 256 MB of free disk space, 128 Mb of RAM, Internet connection.